Body Mass Index (BMI) is an excellent indicator of the weight status of a person. Its significance also lies in the fact that the normal values are based on the effect of body weight on disease and death, irrespective of the age and gender of an adult person. A healthy BMI for adults is between 19 and 24.9. A high BMI is predictive of death from cardiovascular disease. Diabetes, high blood pressure, some forms of cancer, osteoarthritis and many other ailments are also common consequences of overweight, and obesity in adults. Obesity itself is a strong risk factor for premature death. The BMI also allows us to judge the nutritional status of an individual. A BMI of less than 18.5 is considered to denote undernutrition. Recently, it has been shown that the BMI used along with the Waist-Hip Ratio (WHR) is better in predicting risk for many of the serious disorders such as diabetes, high blood pressure, lipid disorders and atherosclerosis leading to heart attacks and strokes etc. Research has shown that much more than the weight of a person, it is the shape of the body which is important in determining risks for the development of many serious disorders such as diabetes, high blood pressure, lipid disorders, atherosclerosis leading to heart attacks and strokes, and many other ailments. Research shows that people with "apple-shaped" bodies (with more weight around the waist) face more risks than those with "pear-shaped" bodies that carry more weight around the hips. Recently, it has been shown that the Waist-Hip Ratio (WHR) used along with the BMI is better in predicting risk for many of the serious disorders such as diabetes, high blood pressure, lipid disorders and atherosclerosis leading to heart attacks and strokes etc. DIET is the mainstay of weight management and plays a central role in diabetes treatment. But for you to follow a diet for a long period of time, the diet needs to be individualised to your needs. It must be realistic, flexible, and take into consideration the your likes and dislikes, to as large an extent as possible, and must suit your lifestyle. Most of the diet sheets and charts which are given to you either in order to lose weight or for the treatment of diabetes are monotonous and very difficult to understand and follow for any long period of time. Moreover such sheets and charts rarely, if ever, take into account the traditional Indian foods which are often a mixture of many ingredients. This makes it quite difficult to calculate the calories in the foods you normally eat ! This is where the Calorie Counter can help you tremendously. So how is this to be used? First, go to the BMI and the WHR Counters and find out your body weight status. Do you need to lose weight, gain some pounds or do you want to maintain your present weight but still keep to your diabetes treatment. In order to lose weight, you must understand that for a person to lose one kilogram of weight the body must have a negative balance of 7700 calories ( 3500 calories to lose one pound of weight). In simple terms, what this means is that if you want to lose one Kilogram of weight, the body must "lose" 7700 calories in excess of what it takes "in" in the form of food. This can be done in two ways: either you eat less and therefore take in less calories or you exercise more and lose that many more calories. It would be better if one were to do both. that is, take in less calories and lose some more than you are doing at the present times. Use the Calorie Counter and roughly estimate the total calories that you eat in a day. Now from Counter, see what food items you can either omit from your diet or eat in less amount. The Counter will tell you the number of calories which you will be "losing" by eating less. Next, use the Activity Log, to see what additional form of exercise, and for what duration, will allow you to "lose" more calories. In both cases, diet as well as exercise, make only those changes which you feel you will be follow for a long while. Now add up the total calories "lost" per day. 7700 divided by this figure will tell you in how many days you will be able to lose one kilogram of weight. As an example, if the calories "lost" each day is 350 calories, you will lose one kilogram of weight in 20 days! You should aim to lose about 1.5 to 2 kilograms each month till you reach your optimal weight. In case, you find that you have to gain weight, the Calorie Counter will show you which items you can increase in your diet and also the calories which you will gain. Thus, a judicious use of the Calorie Counter and the Activity Log, will allow you to reach your desired weight, whilst at the same time allowing you to follow your diabetic diet, if you have diabetes. ANOTHER way by which the Calorie Counter can be of immense help is if you have been given a fixed number of calories to eat everyday as part of your diabetic diet prescription. As we have said before, such fixed calorie diets are usually given along with diet sheets. Most people feel that such sheets make the diet dreary and dull. Not only are the instructions in such sheets difficult to understand, but they are almost impossible to follow for any period of time! Here again, the Calorie Counter can make the diet easy and interesting. From the varied foods given in the various categories you can chose the items which you would like to eat and the Counter will tell you the amounts of these foods which you can eat so that the total calories in a day meet your prescribed calorie number. Moreover, in view of the choices available in each category, you can vary your diet such that it never become dull and monotonous. We will be continually be adding more and more items to the Calorie Counter. In fact, if there is a food item which you like and which does not find a place in the list, please let us know. We will definitely add it to our list. You must realise that the caloric value of the foods can vary according to the method used in cooking, the spices and masala used, as well as the amount of oil/ghee utilised. Thus, when calculating the calories for each item, you must assume a caloric variation of 15-20 calories from the given value. This is especially true when one considers the diversity of India and its foods. This is useful to remember when you do not see the expected change in weight! Which is the reason why we will soon have a detailed Counter in place in which you can place in the recipe you use to make the food items including the types and amounts spices, oil, etc and the other main ingredients and the Counter will give you the precise calorie content of the food item. So use the Calorie Counter and the Activity Log���.. Exercise has an important role to play in diabetes treatment as in any weight management regimen. If you have diabetes, regular exercise can increase the sensitivity of the body to insulin by more than 30% and many of you will find that this along with your diet is more than enough to control your diabetes. Others may find that they have to take less of the tablets or even insulin! The Activity Log will also show you the amount of calories which you will "spend" in carrying our your exercise and this will help you to keep within the prescribed number of calories for the day. Moreover, many people with diabetes need to optimise their weight. The Calorie Counter will tell you about how you can reduce the intake of food items and the calories "lost", whilst the Activity Log will tell you the number of extra calories which you will "lose" depending on the type and duration of the exercise you choose. At the same time, you must remember that the figures given are approximate and for a person weighing 70Kg. You may lose slightly more or less depending on your weight. But this difference is usually small and you should soon see the difference in your weight. So exercise�����. "You have nothing to lose but weight itself!" Body fat percentage is generally accepted as a better gauge of fitness than weight. When in ideal shape, body fat will make up about 14% - 17% of a male's body weight and 21% - 24% of a female's. The remainder of the body's weight is composed of water (55%-60%), muscle and other lean tissue (10%-20%), and bone and minerals (6%-8%). In other words, a 150-pound woman who is within or close to her ideal body fat composition range at 22% will have approximately 33 pounds of fat, 86 pounds of weight composed primarily of water, 20 pounds of muscle and other lean tissue, and 11 pounds of bone and mineral weight. This total then makes up her total weight of 150 lbs. Now take the example of another woman who weights 150 pounds, but has 30% fat on her body. She would have 45 pounds of fat on her body, and the rest of her weight would be divided among muscle, bone and water. Her non fat body composition might look like this, 79 pounds of water (53%), 17 pounds of muscle (12%), and 9 pounds of bone and minerals (6%). Both women weight 150 lbs. and are about the same height, but one looks much different because she has less body fat. Medical professionals have determined that a healthy range of body fat is 14%-20% for men, and 17%-24% for women. But until recently, accurate methods for measuring and monitoring body fat have not been available to the average person. As you can see, the goal of losing 20 pounds is not realistic or healthy. At 110 pounds, this woman still requires 100 pounds of lean body mass (bones, organs, etc. ), but would only be carrying 10 pounds, or only 9% body fat. From the chart above, you can see that this is a dangerously low percentage. The suggested level of body fat for a female athlete is 14 to 20 percent; for male athletes, it's 6 to 13 percent. The ideal depends greatly on the requirements of the sport. For that "gotta have body," shoot for a body fat percentage between 21 and 24 percent for women, and from 14 to 17 percent for men. But anywhere from 25 to 31 percent for women, and 18 to 25 percent for men, is considered healthy. If you're a woman and your body fat is more than 32 percent of your weight, or if you're a man and your body fat is more than 25 percent of your weight, that's a sign of obesity. Individuals in this range should seek the advice of a health care provider to begin a weight loss and exercise program. Always check with your doctor before beginning a weight loss or exercise program. Women need at least 10 to 12 percent body fat to maintain healthy bodily functions and continue having periods; men need at least 2 to 4 percent to maintain essential bodily functions. Exercise, along with diet forms one of the mainstays of diabetes management. A regular exercise program, tailor made for every individual, and undertaken after due fitness evaluation, with regular monitoring still remains an essential part of modern diabetes management in spite of the availability of many new oral hypoglycemic agents and newer types of insulin. Regular exercise confers tremendous benefits on glycemic control. Although, at one time it was thought that exercise helped only by optimizing one's weight, it is now widely appreciated that even without a change in the weight of the person. A regular program of exercise can bring down the blood glucose levels by a significant amount. This is due to the fact such an exercise program has been shown to increase insulin sensitivity by as much as 25-30%! Exercise helps to correct the associated lipid abnormalities, increases cardiovascular fitness, psychological well being and of course, helps in weight control. But any form of exercise, to have beneficial effects, must be done systematically. It is not enough for you to be told that you should exercise. The exercise regimen should be "prescribed" to you. You must understand the basics of exercising , so that you can derive the maximum benefits from this, and at the same time, avoid any problems which may rise from irrational exercise schedules. One of the most important aspects of any exercise schedule is to know what intensity you would exercise at? This is judged by your heart rate when you exercise. The correct heart rate is judged as a percentage of your maximum heart rate, which will be calculated for you by this Calculator. No matter what your exercise goal, you need to work out at the "right intensity". Too hard and you run the risk of injury or you just quit because exercise is too painful. Exercise does not have to be painful to be effective. If you exercise too easy, chances are that you will never get where you want to be. Working out at the right intensity, called your "Personal Target Zone", is the key to your success. Your heart rate is the only true way to measure your exercise intensity. When you increase your intensity, your heart rate goes up and when you slow down, it drops. You can't gauge intensity by how you feel, or how much you are perspiring. An accurate gauge of intensity is the only way to ensure your hard-earned time and efforts are paying off. This exercise zone is at 50-60% of your maximum heart rate. Most people walking at a comfortable pace are in this zone. The body burns 85% fat, 10% carbohydrates and 5% protein when in this zone. This is the zone at which most of you will be walking in. Some of you will keep in this zone for almost all the time, others may use this as a stepping stone to a more vigorous exercise schedule in other Zones. This is also the zone in which the warming up and cooling off in your exercise schedule is done. This zone has been shown to help decrease body fat, blood pressure and cholesterol. It also decreases the risk of degenerative diseases and has a low risk of injury. 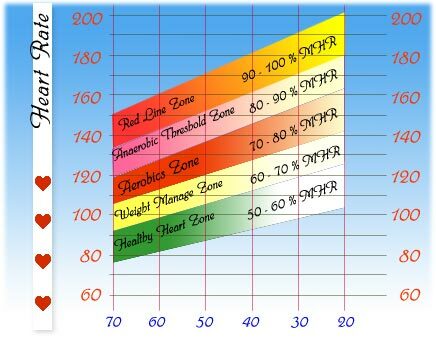 Zone 2 THE WEIGHT MANAGEMENT ZONE: 60% to 70% of your individual Max HR. It's easily reached by jogging slowly. While still a relatively low level of effort, this zone starts training your body to increase the rate of fat release from the cells to the muscles for fuel. Some people call this the "fat burning zone" because up to 85 % of the total calories burned in this zone are fat calories which is equally as important. Fit and unfit people burn fat differently. The more fit you are, the more effectively you use fat to maintain a healthy weight. On the other hand, perhaps you've been exercising vigorously, but not losing the weight you expected to. Could be you've been working too hard and need to drop back to this zone and exercise longer. To burn more total calories you'll need to exercise for more time in this zone. In this zone -- reached by running easily as an example -- you improve your functional capacity. In this zone of exercise intensity, the body uses both stored fat and carbohydrates for energy. At 70-80% of your maximum heart rate, 50% of your calories burned in this zone are fats, 1% are proteins and 50% are carbohydrates. This intensity zone is excellent for increasing the number and size of blood vessels, increasing vital capacity and respiratory rate and achieving increases in pulmonary ventilation, as well as increases in arterial venous oxygen. The aerobic phase of your workout should be of 50 minutes or less to prevent build-up of lactic acid. Always warm up with 5-10 minutes of easy pace and after the aerobic phase, cool down with 5-10 minutes at an easy pace. This zone is reached by going hard -- running faster. Here you get faster and fitter, increasing your heart rate as you cross from aerobic to anaerobic training. At this point, your heart cannot pump enough blood and oxygen to supply the exercising muscles fully so they respond by continuing to contract anaerobically. In this zone of exercise intensity can be used to build your heart/lung capacity and endurance. In this zone, the body burns more calories but mostly from carbohydrates rather than fat. At 80-90% of your maximum heart rate, 15% of your calories burned in this zone are fats, 1% are proteins and 85% are carbohydrates. This intensity zone improves VO2 maximum (the highest amount of oxygen one can consume during exercise) and thus an improved heart/lung system, and a higher lactate tolerance ability which means your endurance will improve and you'll be able to fight fatigue better. This is where you "feel the burn." You can stay in this zone for a limited amount of time, usually not more than an hour. That's because the muscle just cannot sustain working anaerobically (this means without sufficient oxygen) without fatiguing. The working muscles protect themselves from overwork by not being able to maintain the intensity level. Zone 5 THE REDLINE ZONE: 90% to 100% of your individual Max HR. This is the equivalent of running all out and is used mostly as an "interval" training regiment -- exertion done only in short to intermediate length bursts. Even world-class athletes can stay n this zone for only a few minutes at a time. It's not a zone most people will select for exercise since working out here hurts and there is an increased potential for injury. MOST PEOPLE WITH DIABETES WILL EXERCISE IN ZONE 1 AND MAY GO UP TO ZONE 2 AFTER A PERIOD OF REGULAR EXERCISE IN ZONE 1. No exercise regimen should be carried out without consulting your doctor. o Are you a man over 40 or a woman over 50? o Have you ever been told you have heart problems, high blood pressure, diabetes, or a bone or joint problem, such as arthritis, that has been or could be aggravated by certain types of exercise? o Do you frequently suffer from chest pains, feel faint or have dizzy spells? o Are you taking prescription medication, such as those for a heart problem, high blood pressure, diabetes? o Is there another medical reason why you think perhaps you should not exercise? If you answered "yes" to any of these questions, consult your healthcare provider before you being training. ALL PEOPLE WITH DIABETES MUST UNDERGO A PRE-EXERCISE EVALUATION. All patients should undergo a complete history and examination to identify cardiac, macro/microvascular and neurologic complications. The extent of investigations would dependent on the risk level of the patient and would need to be individualised. Exercise should not be prescribed to patients with very high blood glucose, and those in ketosis, unless treated adequately. Patients with significantly retinopathy and renal dysfunction may also need to undergo specific treatment before embarking on an exercise programme. Patients with foot infections should avoid exercise until adequately treated. Patients with cardiovascular abnormalities should not undertake exercise unless this is in close consultation with cardiologist. Other contraindications to exercise as seen in non diabetics also apply to patients with diabetes. This calculator tells you how many calories you should be eating every day in order to maintain your present weight. This is essential when you want to make changes to your weight, either lose or gain. As you know, 7700 calories equals one kilogram of body weight. In simple terms, if you need to lose one kilogram of weight, your body will need to have a negative calorie balance of 7700 calories. You will then have to decide in how many days you want to lose this weight. If you decide to lose one kilogram every two weeks, this negative balance will have to be spread out over 15 days. Which means that you would have to have a negative calorie balance of about 500 calories per day. This can come through a reduction in food intake as well as increased loss of calories through activity and exercise. But the majority will have to come from a decrease in the calories which you take in as food. Using this calculator allows you to judge the calories which you need to eat to maintain your present weight and therefore will then let you know how many calories you should be eating in order to keep to your weight loss goal. As an example, let us say that a person calculates that he needs 2500 calories to maintain his present weight. Now if he wants to lose one kilogram of weight every two weeks, then, as we have seen above, would have to reduce his food intake by around 350 calories ( the other 150 being lost through exercise) per day. Then using the Calorie Counter or the Diet Charts derived from the Indian Food Pyramid or the Ready to use Diet Charts, you can then draw up your diet. When you use the Calculator, you will be asked to select your activity level. A brief guide to enable you to choose the level is given below. Sedentary: Sitting, standing, and driving for most of the day. Lightly Active: Cooking, light cleaning, light yard work, slow walking, most major activities involve sitting. Moderately Active: An occupation that includes lifting, lots of walking, or other activities that keep you moving for several hours qualifies as moderately active . Very Active: Heavy manual labor, a very active lifestyle, dancer or very active sports played for several hours almost daily. Extremely Active: An elite athlete in training, or an extremely active lifestyle - both a work and at play. Sports or activity last for several hours, almost daily. You should come back to the Nutritional Profile Calculator every 3-4 weeks in your schedule as with the changes in your weight, your Profile will change and you will have to make the necessary changes in your diet regimen.